Last Friday, I heard that Activision and Terminal Reality would be making a first-person shooter out of the Walking Dead. Shortly afterward, I witnessed people (read: co-workers, folks I follow on Twitter, etc) freaking out. Why does everything have to be a first-person shooter?, people howled. This is not what The Walking Dead needs, others exclaimed. I am both an optimist and a contrarian, so I started to shake my head. Why is this anti-FPS spit and snark always the reflex? What do people have against first-person shooters? I think the problem must be that there are so many of them, but what to make of the fact that so many of them are very good? Are we not counting Portal 2 as a first-person shooter? Are we not counting 2012 zombie-survival phenomenon DayZ? Does multiplayer Battlefield 3 not count, or is it that the millions of people who enjoy Modern Warfare 3 don't know what a good thing is? I think some people groan about the possibility that something they love will be ruined because it is being turned into a first-person shooter. We all remember how James Bond games were ruined by turning into first-person shooters, right? GoldenEye, anyone? Oh, no. That was a good game. Remember the side-scrolling Metroid series being mangled into a...uh...magnificent, critically acclaimed trio of first-person shooters? Star Wars? 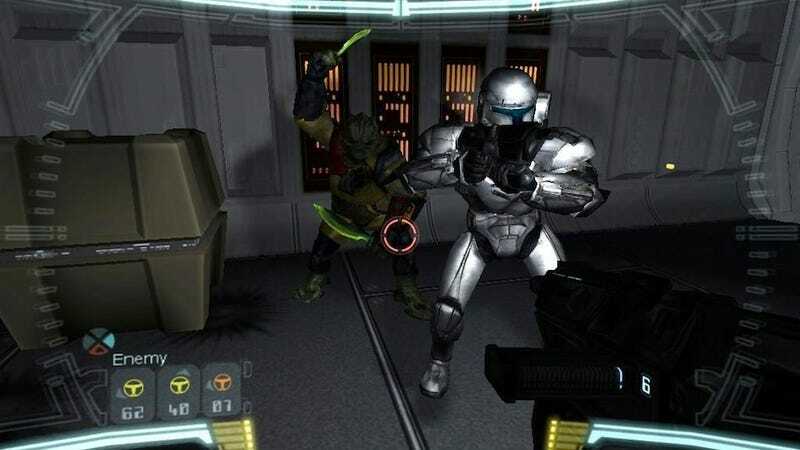 It had Republic Commando, among others. That Syndicate remake? Turns out it was a pretty good FPS. It wasn't all that Syndicate-y, but it was good. Remember how they ruined X-Com by turning it into an FPS? No? Of course not. It hasn't happend (yet?). The only franchise that was turned into a first-person shoote that I believe there is actual negative consensus about is Shadowrun. Right? Am I missing any? First-person shooters introduce the opportunity for a more intimate connection to a game character. They enable the player to feel like they are in a virtual world instead of just manipulating a puppet that lives in one. They let you see a narrower breadth of the world, but they let you see it more closely. They often compel you to shoot, shoot, shoot, but they don't always. Sometimes, they simply want you to be able to look someone in the eye. At worst, they're as wonderful and as flawed as any other style of game. I understand that the reflex against the announcement of a new first-person shooter—from Terminal Reality, the main studio behind Kinect Star Wars, no less!—is seen as the lazy, easy decision flow-charted by an Activision marketing team that may want to marry a hot license with the a crowd-pleasing genre. I understand that the news of an FPS Walking Dead published by Activision feels like an affront to the subtler, more lovely and acclaimed Walking Dead adventure games from scrappy Telltale Games. But, really, what's so bad about first-person shooters? What series and franchises have they actually ruined? If you choose to bash the FPS, don't let the people who are making The Unfinished Swan hear you. They're busy making one of the coolest games of the year (and it's an FPS). If You Must Buy a First-Person Shooter on PS3, How About This Weird Painting One?